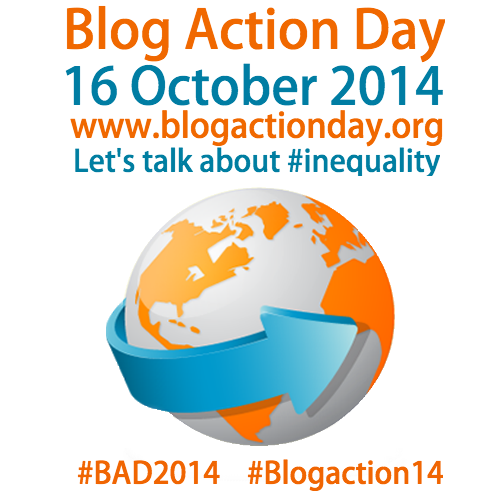 This post is part of Blog Action Day 2014, uniting thousands of bloggers around the world on the theme of INEQUALITY. Visit their website or Twitter account for links to blog posts, podcasts and other resources. As for me, thinking about what to write has been both exciting and daunting. Inequality is a HUGE theme, pervading every part of the world and area of life. It is something I have grown up with, often experienced in all its rawness at first hand. Even if I only focused my post on the UK I was still faced with hundreds of things I could write about. Where to start, let alone what to say? But then, a few days ago, the word inequality appeared in my Twitter stream, and I knew what I needed to focus on. It was in a tweet from Harry Leslie Smith, a 91-year-old campaigner, author of the recently published Harry's Last Stand. Born and brought up in grinding, relentless poverty, Harry recalls the inequality of life before the welfare state and the National Health Service, when those who had money could afford doctors and medicines, while his sister died of TB in the workhouse infirmary - the only "care" available for her. You can read an abridged extract here. It strikes me that the Smiths were what we nowadays call "hard working poor": people working long, exhausting shifts in the hardest of manual jobs, but still barely managing to keep their children fed, housed and clothed. CEOs and business leaders work long hours too, of course, but they at least are rewarded with obscenely high salaries, bonuses and perks. MPs also work hard, but whenever they feel that £67,000 per annum plus expenses isn't nearly enough, they can vote themselves a pay rise - and then still manage to look their poor constituents in the eye. Meanwhile, nurses and paramedics are told the public purse cannot afford to give them a 1% increase - although that public purse could easily be made much larger if the government stopped giving tax cuts to those who are already opulently rich, and pursued wealthy tax dodgers with the same vigour they reserve for benefit fraud. So much inequality, in what is supposed to be an enlightened society... And such unenlightened, unfair solutions. Bankers and businesses caused the conditions which led to austerity, but the disabled and already poor are made to pay the price, and are often derided and scapegoated in the process. I realise too that Harry Smith was forged in the same unsparing crucible as Nye Bevan, the Labour politician who, having seen his father and others die needlessly, masterminded the creation of the National Health Service. They were part of a movement and desire to build a better world out of the destructive ruins of World War II, which included social housing, health and welfare provision for the poor: to bring in fairness and equality, and banish the final ghosts of the conditions Harry grew up with, which we often describe as Dickensian, easily forgetting that Charles Dickens experienced poverty and inequality a full century before Harry's birth. What we cannot forget though, is that even now, despite the advances which mean even the poorest have electricity and indoor plumbing, about one million people - including poorly paid workers and those with disabilities - rely on food banks and charities to ensure they and their children have enough to eat. So when the government says cutting benefits and the public sector is the only way out of the economic deficit I wonder what happened to the spirit of a society which, despite post-War austerity, was able to boost welfare, build social housing and create the NHS. And I also wonder... what does it say about modern Britain, that it allows its most vulnerable citizens to suffer most from a crisis caused by corporate greed? One of Dickens' most famous characters, Ebenezer Scrooge, had the benefit of visits from the ghost of Jacob Marley, rattling his self-inflicted chains and summoning other spirits to show Scrooge the error of his ways. Scrooge was shown his miserable, lonely past and future, and given the chance to change his present in order to change his future. We as a nation have been given our own "ghost of times past", in the shape of Harry Smith and others of his generation to remind us of the awfulness of conditions our grandparents thought had been consigned to history. The memories might well be grim and harrowing, but - as with tales of war, violence and oppression - we need to hear them, in order to learn, then vow, truly "never again". Like Scrooge, we can and must change our present, in order to build a more just and equal future. Because if not... then Harry/Marley's dire warnings will come to pass, and times past and times to come will look frighteningly similar.